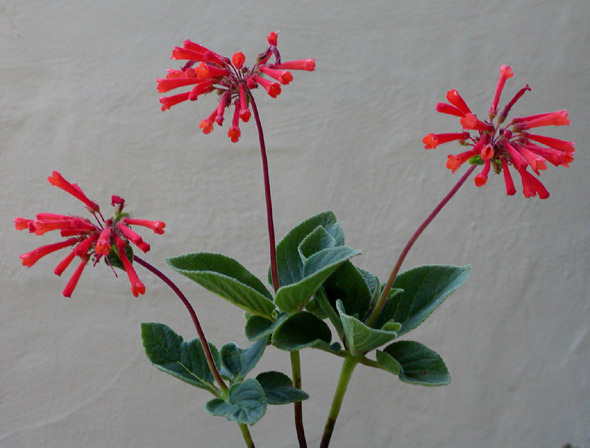 Sinningia insularis is an easy-to-grow species with abundant, rather small, reddish-orange flowers. A distinctive feature of S. insularis is the large shiny red fruits (see picture below). This species self-pollinates readily. The leaves are very firm and stiff, almost as much so as those of Sinningia macrostachya. They are usually in whorls of three. In my yard, this species is tolerant of full sun and occasional drought. I believe it is one of the easiest sinningia species to grow. For the winter of 2012-2013, I left most of my sinningias out exposed to the elements, in their pots. Winter rainfall was about normal in its totals, although concentrated most in November and December. Temperatures were a bit lower than normal. The coldest nights were around 27 F [-2.5 C]. Most of the sinningias survived the exposure without problems. 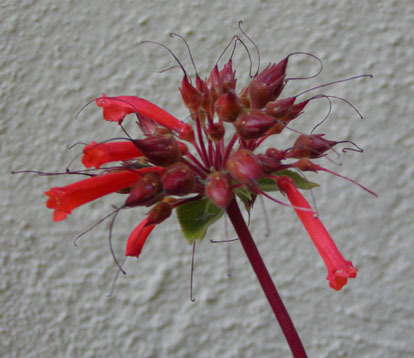 Sinningia insularis was a conspicuous exception. I had three large tubers of it, with their pots placed in different parts of the yard. Two of the three tubers rotted. Therefore it appears that this species has tubers that are vulnerable to being cold while wet, more vulnerable than most other species. Dormancy Stems fully deciduous. However, new stems can sprout as old ones drop off, so it appears that full dormancy is facultative. Hardiness Has survived 28F (-2C) in my yard when kept dry, but see discussion above. Recommended? You bet. Flowers are on the small side, but S. insularis is attractive and easy to grow. Taxonomic group The douglasii group of the Dircaea clade. As Rechsteineria insularis by Hoehne, in 1958. Chautems transferred it to Sinningia in 1990. Etymology: from Latin insula ("island"). According to Mauro Peixoto (information on Gesneriphiles), this species comes from Ilha dos Alcatrazes, an island in São Paolo State (Brazil).